Ronald Reagan George Bush and Howard Baker attend a campaign rally at the United States Capitol in Washington DC on September 15, 1980. 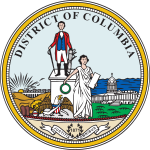 The 1980 United States presidential election in the District of Columbia took place on November 4, 1980. All 50 states and The District of Columbia were part of the 1980 United States presidential election. Washington, D.C. voters chose 3 electors to the Electoral College, who voted for president and vice president. Washington, D.C. was won by incumbent President Jimmy Carter (D) by a 61-point landslide. Carter's 74.9% of the vote represents the lowest vote won by a Democrat in the District of Columbia. ^ "1980 Presidential General Election Results - District of Columbia". uselectionatlas.org. Retrieved May 24, 2015. This Washington, D.C. elections-related article is a stub. You can help Wikipedia by expanding it. United States presidential elections in Washington, D.C.